wait…your neighbors don’t park on their yard? | you seem nice. wait…your neighbors don’t park on their yard? welcome to this edition of true life: my neighbors are hoodrich. i took that picture today before i went to class. translation: my dad is a little pissed. he keeps talking about city ordinances against that or something? i don’t really know. either way i thought it was hilarious. i told like 4 people about this upcoming story and they all thought that the main plotline was all my fault. but it wasn’t. allow me to explain. all of the excitement happened last night. i usually have to call the home phone to ask someone to come move my mom’s car so she doesn’t have to do it in the morning. so i did. my dad answered and said go ahead and park your mom’s not here. so i was like oook. done. as i pull up to the house i noticed that david’s truck was missing, too. so i thought eh, whatever he’s probably up to some shenanigans with his semi-hooligan friends. i walk into the house and notice the door to the backyard is open. i called for my dad and got nothin. i knew he was home because he answered the phone like 2 minutes ago. so i was like ok, whatevs…i don’t know what’s goin on and i’m gonna ignore the eery silence and go to my room. then, like the voice of GOD, my dad yelled my name. it sounded like he was in the attic, and i thought i accidentally closed the stairs that pull down from the ceiling, but then i remembered that was impossible because they would have had to have been pulled down to begin with. so i questioned the bodiless voice and it responded with “i’m outside. i’m fixing this broken window. a bird flew into it!” the window is located in my parents’ room. so then i realized that the eery silence was due to the lack of mojo running in and/or outside coupled with the sounds of [insert family member here] yelling at him for doing something other than sitting. my mom and dad just got home so my mom went into their bedroom and heard the wild sounds of nature. so she told my dad that she thinks someone may have tried to break into the house. so my dad said he “sweeped” the house then went outside to the backyard. in the midst of his investigation he forgot to close the side gate. saw the broken window followed by a copious amount of feathers. bird unable to fly on the ground. who spends the majority of their time in the backyard? mojo. his gate to the new world had been opened. so he flew the coup. this led to my mom driving around the neighborhood looking for him. anyway, we get a phone call around 11 and it’s a guy saying that he thinks he has mojo based on the description from the email: a chihuahua that answers to the name of mojo and has the coloring of a german shepherd. a chihuahua that looks like a german shepherd. can those 2 images be more different!?! turns out it was mojo. he ended up in some poor old man’s garage. needless to say, there was a lot of information to process within the span of 5 minutes. it was kinda ridiculous. and going back to the reactions of the 4 individuals to news that mojo was missing, this was their question: did you let him out? NO, I DIDN’T LET HIM OUT. i mean, he’s annoying but i wouldn’t let him loose! how rude. side note: i’ve been drinkin tea like it’s goin outta style. 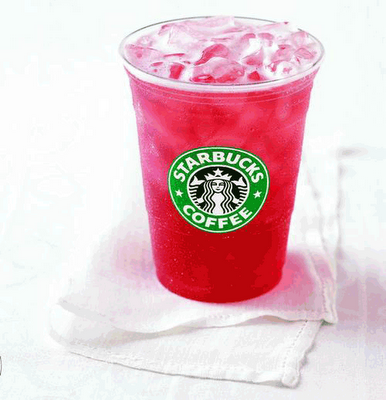 i think i could drink tazo passion tea from starbucks everyday. EVERY. DAY. i probably should just buy a box. passion tea or passion tea lemonade = so freakin good AND it's a nice color. i’m trying to think of any other ridiculous things that might have happened but that’s the main one. my grandma started a watercolor class? taking her to michael’s was pretty much the funniest thing ever. she hasn’t quit yet, so i guess that’s good? also, there seems to be an emerging trend of having a howl at the moon happy hour party. pretty sure my parents are gonna think i’m an alcoholic if i continue to partake in these festivities. but i’m not. pinky promise. ← my socks look like fun…fetti. Hokay, so I know you secretly did let Mojo out. You can’t hide it from me, I’m a top rate detective. Also, their Passion Tea is the STUFF! I always get it shaken though, because I don’t like it when it’s hot. Actually I don’t like anything hot….except food…well some food.